Are You Planning A Kenya Safari To Kakamega Forest? Scroll Down..
“This is what the Garden of Eden must have been like”, the thought will come to you as you walk along one of the trails through Kakamega Rainforest. There are seemingly innumerable varieties of tall trees, some with outlandish shapes and forms that you have never seen before. Your assigned AfricanMecca guide who is an expert naturalist explains to you that this beautiful forest with its 380 species of trees, plants and herbs once extended through Central Africa up to East Africa. There are dazzling lush flowers everywhere lighting up the green with their varied colors, among them 60 types of orchids and 9 species that you will find only in Kakamega Forest National Reserve. Hovering among the flowers are the butterflies and some 400 species have been noted. Their vibrant hues and forms are as fascinating as their names, regal swallowtails, forest mother of pearl, black-tipped diadems, charaxes, green-banded swallowtails and Hobart's red gliders. Other insects like the stick insects, fireflies and goliath beetles have unique characteristics of their own and each is a wonder to look at. The 360 species of birds are also incredible. Avian lovers on a Kenya birding safari will relish in taking pictures of species that are native only to Kakamega Forest like grey-chested babbler (aka grey-chested illadopsis). As you follow the trail to the higher elevations of the forest, you will also visit a cave known for its resident bats, the hammer-headed fruit bat, known to be the largest in all of Africa. 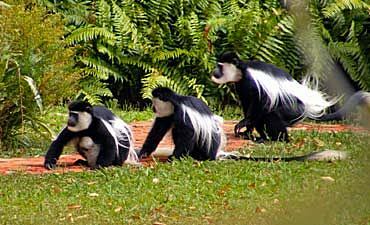 The tree branches have their own residents like 7 varied species of primates including colobus monkey, potto, de brazza’s monkey, blue monkey, olive baboon, red-tailed monkey, white-nosed monkey and also reptiles like chameleons, skinks and other lizards. The forest shrubs conceal smaller faunas like forest hogs, duikers, aardvarks, bushbucks, porcupines, mongoose and also flying squirrels. Among the predators, the forest has small cats like civets, genets and servals. This fascinating collection could be attributed to the fact that the flora of Kakamega Forest is a combination of both, those found in the higher and the lower altitudes of western Kenya. Do take the opportunity to go on the early morning twilight hike. Your trek to higher elevations will be rewarded by the superb sight of the fog on the carpet of trees around you. As it lifts slowly, you can watch as the sun rises on one of the most enchanting and unspoiled wonderlands of Africa (read more on when is the best time to go to Kakamega Forest). 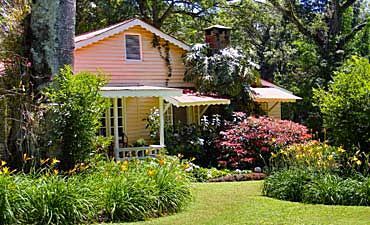 As unique as the forest where it is located, Rondo Retreat is a colonial-style getaway. It is moderately affordable, comfortable and gives you friendly service with basic, no-frills pampered amenities. You will go on forest walks along the distinct trails that will lead through diverse kinds of terrain, affording opportunities to view birds, butterflies, reptiles, small mammals including primates. 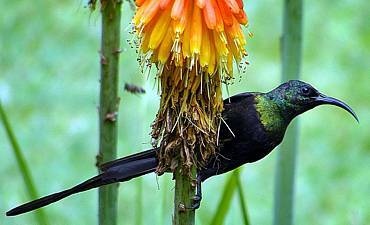 Kakamega being a tropical rainforest has a temperate, warm climate and can be visited at any time during the year. Temperatures do not fluctuate much but it rains more here in comparion to other regions. When visiting Kakamega Forest National Reserve, we recommend combining your safari with a visit to Masai Mara, Amboseli and Lake Victoria. You may optionally extend out to other wilderness areas of Samburu or Lewa - Laikipia ending with a beach vacation and Swahili cultural tour in the exotic spice island of Zanzibar or Lamu, or even Mombasa. ARE YOU PLANNING AN AFRICAN SAFARI TO KAKAMEGA FOREST IN KENYA? HAVE YOU VISITED KAKAMEGA FOREST FOR AN AFRICA SAFARI IN KENYA?